Ideally situated opposite the metro station and with a bus stop at the front door, the Hotel Tbilisi Apart is just 2km from Tbilisi’s vibrant old town. Located on the top floor of a new, quiet residential building, the hotel features 6 apartments ranging from a spacious studio apartment where I stayed, to even more spacious one bedroom apartments. One aspect that needs special mention are the fabulous views of the city both day and night from the balcony. It may seem an odd aspect to highlight but the pictures show how fabulous it is. 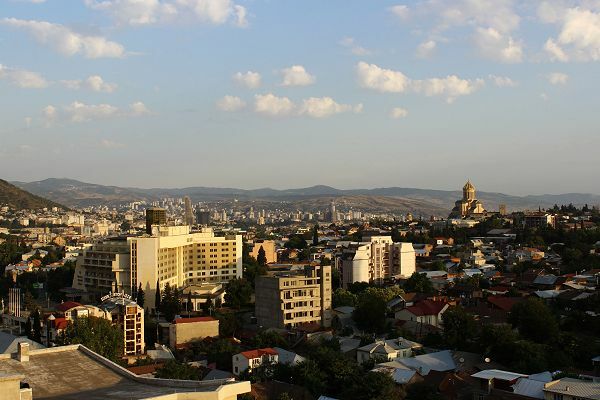 The apartment comes with all the requirements for a comfortable stay and includes a microwave, clothes washing machine (instructions in Russian), air conditioning, heating and basic cooking utensils, although with the affordability of food in Tbilisi you would have no need to cook! The building is quiet and unless you have the balcony door open at night, you can be assured of a peaceful night’s rest in the comfortable bed. Essential supplies can be purchased from the stores outside the building entrance and there is a foreign exchange booth just around the corner. Despite its rather rundown appearance, it is typical of all in the city and offers a good rate. 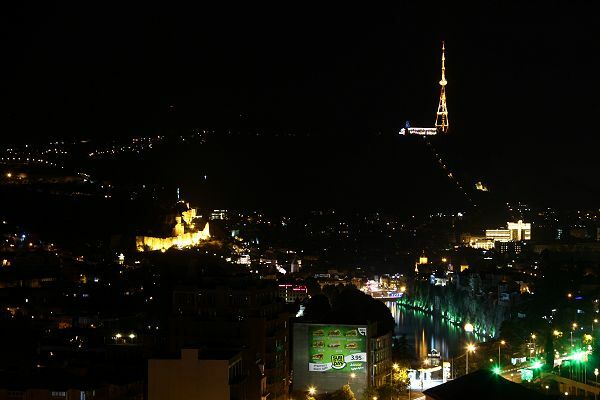 Tbilisi itself is a safe, friendly, vibrant city that offers much to the tourist traveller. If you are into churches there are over 20 ranging from the very visible and recently built Holy Trinity Cathedral to Tbilisi’s oldest church the Anchiskhati Basilica. Tbilisi was founded 1500 years ago at the site where hot sulphur springs came to the surface. You can still enjoy a hot springs bath on the original site! Old Town Tbilisi offers plenty of scope for exploration and is a photographer’s dream, from the quaint balconied houses and the ancient castle on the hill to exciting modern architecture just outside the old city area. The city is renowned for it’s diverse range of restaurants including the Amsterdam Pub where they have great music! Getting around the city is easy – try the tourist hop-on-hop-off bus or take a taxi – from one side of the city to the other will only cost you about GEL10 (A$6). Want to see more of Georgia? Try this 8 day tour that captures much of the best of Georgia.